Successfully Added Teclast X98 Plus 2 Tablet PC - 9.7-Inch Display, 2048x1536p, Windows 10, Android 5.1, Quad-Core CPU, 4GB RAM, OTG, HDMI Out to your Shopping Cart. The Teclast X98 Plus 2 is one of those extraordinary and rare high-end tablet PCs that outperforms all its competitors by far yet, remarkably enough, comes with an unbelievable low price tag. Featuring two operating systems, this Dual–OS tablet supports both Windows 10 and Android 5.1 – allowing you to take the most out of the amazing features offered by both systems. With its epic 8000mAh battery, this tablet computer packs an unbelievable amount of power, letting you browse the web, watch movies, and play the most demanding of games for up to 7 hours in a row. Even the most excessive tablet users out there will be able to get through a full day of tablet usage without needing to worry about running out of juice. What truly sets this stunning Dual-OS tablet apart from its competition is the absolutely mind blowing 9.7-Inch display that portraits all your favorite media and files in mind blowing 2048x1536p resolution. Featuring the latest IPS technology, this 2K display delivers stunning detail and vivid color – allowing you to enjoy a cinematic experience from the palm of your hand whenever you turn on this little beauty. OTG support further enhances your overall user experience as it allows you to connect external hardware devices such as a memory pen, keyboard, or game controller to your tablet PC. Additionally, the Teclast X98 Plus 2 also allows you to connect it to your television thanks to its micro HDMI port – letting browse the web and enjoy latest games, movies, and applications on your big screen TV. Besides its absolutely breathtaking display, this 9.7-Inch tablet PC packs some serious hardware that is guaranteed to bring along an exceptionally powerful experience. Its Intel Atom X5-Z8300 Quad-Core CPU runs at 1.44GHz, however, is capable of reaching burst speeds up to 1.84GHz whenever required. Along with its mind blowing 4GB of RAM, this Dual-OS tablet computer packs enough strength to support the most excessive of multitasking sessions out there – allowing you to enjoy multiple of its amazing features simultaneously without needing to worry about slowing down your tablet. 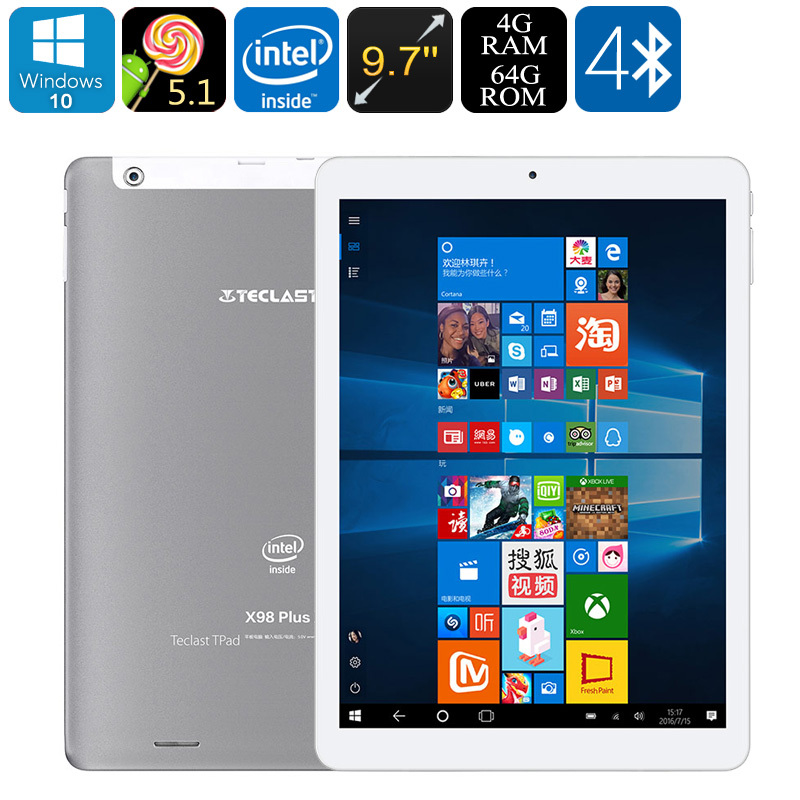 Whether you’re into online gaming, want to enjoy the latest movies in stunning resolution, or simply like to browse the web – the Teclast X98 Plus 2 tablet PC will smoothly handle whatever you throw at it without dropping a frame. Supporting 64GB of storage, this Dual-OS tablet computer holds enough space for you to save all your media and files. Additionally, the Teclast X98 Plus 2 allows you to insert up to 128GB of external memory – assuring that you’ll never run out of storage. From now on you’ll never have to be bored again as, with this beautiful tablet at your side; you’ll always be able to carry along years’ worth of mobile entertainment. Additionally, its ultra-fast Wi-Fi connectivity lets you browse the web, download files, and stream online movies in the blink of an eye. Its sophisticated 2MP camera furthermore lets you engage in HD video calls with all your friends and family located at the other side of the world. The Teclast X98 Plus 2 comes with a 12 months warranty, brought to you by the leader in electronic devices as well as wholesale electronic gadgets..